So, as the beautifully illustrated post by my wife (see below) attests, we were recently in the UK, and spent a good portion of that trip inside pubs enjoying traditional pub food and cask-conditioned, hand-pulled ales. I describe the beers in this way for a reason. You see, the old joke that Americans never seem to tire of cracking when offering me a beer goes something like this: “Want a beer, Jonny?” “Yes, please, I’d love one.” “Here. It’s been in the fridge, sure you don’t want me to warm it up for you?” Oh, the mirth. British beers, you see, have a reputation of being served warm. This is not true, unless you consider cellar temperature to be warm. Personally, when I think of warm, I think, 80 degrees, blue skies, and the merry chirping of songbirds, not a pint of frothy ale from a cask kept in a cool, dank cellar, served at around 50-55 degrees. By contrast, American beers are always served cold, sometimes painfully cold, and historically, this has, in my opinion, been because they taste so bad when drunk at any higher temperature. Nowadays, there are many delicious, craft-brewed, bountifully-hoppy, traditional-style beers being made in America, and I enjoy as many of them as I can. In our fridge right now are a variety of excellent English-style beers by Wild Goose ales, brewed in Frederick, Maryland, that we’re working our way through and appreciating drop-by-drop. But here comes my point, these beers would be much tastier if served a bit warmer. Cooling anything reduces evaporation and prevents the perfumes and flavors of the beer from mixing with air, and therefore, one tastes fewer of the drink’s complexities. To me, this is a shame. After all, why spend all the time and effort imbuing ones’ ale with complex, herbaceous flavors and then chill the crap out of it so the drinker cannot appreciate them? This is why British ales – bitters, pale ales, IPAs, milds and porters – are best served at cellar temperature. This brings me to my second point. Hand-pulling. We recently watched a show called “Sam the Cooking Guy” or something, on NYCTV, and the host visits an “English pub” in Los Angeles. It’s an English-owned establishment and serves all manner of fayre from Blighty. Sam asked the owner to show him how to pull a pint. He then holds a glass to the tap and pours a Guinness. I like Guinness as much as anyone, but it’s Irish, not English, and you can’t pull a Guinness because it’s a cream-flow beer. 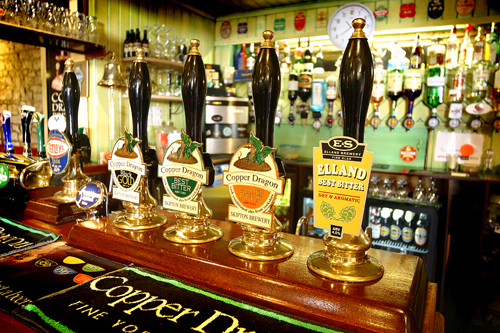 Pulling a real ale is a bit like pulling the arm on a slot machine, except it must be done carefully and at a smooth, measured rate. The idea, you see, is to aerate the beer, giving it a head, and allowing air to mix with the beer to release it’s flavors. Typically, for a pint two pulls will be needed, followed by a minute or so of contemplation – a la Guinness – while the air settles and pint comes to a rest. I have visited lots of English-style pubs in America and not one of them has real, hand-pulled ales. Why is this? Is it not allowed by law? Is it too complex a procedure? I’d love to know why because I really miss hand-pulled ales, they just taste better, and unlike an ordinary beer, you have to have a bit of skill to pull a good one. Any fool can turn on a tap, but only a practiced-arm can pull a great pint. Anyone who’s interested in “real ales” (i.e. 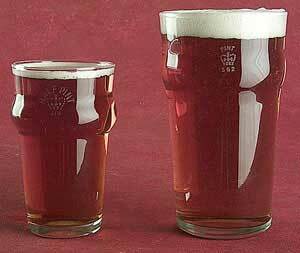 cask-conditioned, hand-pulled ales from the British Isles) should check out the CAMRA website – camra.org.uk. CAMRA is the campaign for real ale and began as an organization to protect the integrity of British ale-producing and serving from the onslaught of, admittedly delicious, lagers and pilsener-style beers that began to be imported to Britain during the 1960s. After living in the UK for a few years I fell head over heels for the “real ales”. Cool post and thanks for the websites. You’ve inspired me to drink some “good stuff” tonight, cheers! We’ve got a few pubs in Williamsburg that serve cask ale. The real deal. Some of them do it well and some don’t (they either serve it too soon, or leave it too long). But it’s out there! that sounds great! Can you supply the details of said pubs? (adopts strongest and most chauvanist Northern English accent) It’s about time I took the wife out for a drink somewhere new! Brooklyn Ale House had a lovely pull of Brooklyn Brown from the cask last week. Barcade usually has some, Spuyten Duyvil always has some, Mugs Ale House often does. There are a number of places in Manhattan, too, but we tend to go to d.b.a. Last but not least, you can go to the annual Cask Head Ale Festival (http://beeradvocate.com/events/info/16191) starting Feb 22. Here is a microbrewry in the US that has 45 of its own receipes on tap at all times. Here they like to celebrate Firkin Monday when a new real-ale is tapped. I am a bartender there and a great supporter of hand-pulled beer. We celebrate styles from all over the world. If ever giving the opportunity don’t pass up on Dragonmead Microbrewry in Warren MI. after a climbing trip to Sheffield, I’ve been wondering why the hell we don’t have a properly pulled pint anywhere in a country full of amazing microbrews.. i’m lucky enough to live in Colorado, with Left Hand, Avery, New Belgium, Ska.. ect… but it looks like i gotta wait for a trip to the Sheaf for a tall frothy glass of Easy Rider. and another thing: it was real cool to drink in a number of pubs that sat more like your aunt’s library than a piss-stink frat hangout with a crooked pool table. AND, the (generally) lower alcohol content meant i could drink the hell out of that delicious beer..
Update 10/16/12: Add Forest & Main, in Ambler, PA, to the growing list of pubs serving cast conditioned, hand-pulled ales this side of the Atlantic. Excellent house made ales, good food. http://forestandmain.com/. and also recognized by Cask Marque (2017), so if your thirsty for the real thing – Give https://www.facebook.com/yorkshiresquarebrewery/ a hoot and a holler (excellent food trucks all the time) and I’ll be having a pint or two with you! @Matthew: there was an article in the Guardian not so long ago about the appearance of real British-style beers on the West Coast – i think mentioning Yorkshire Square. The argument, as far as I recall, was just like you mentioned, the prevalence of high octane, heavily hopped IPA and Barley-wine styles is an inhibitor for the rest of your day, to which these lower alcohol, more approachable/quaffable traditional British styles were the reaction. It’s also interesting to note, as I did on a beginner’s brewing course that I took last fall, that it’s actually easier to brew higher alcohol beer than one around 5% because the higher alcohol level brings greater sweetness to the brew and covers up a host of potentially less enjoyable flavors that inexperienced or careless craft brewers generate. I’ll check it out on FB on when I make it out to LA, i’ll stop by! ← Jacques Fast Food – Whole Wheat Pasta with Leeks, Asparagus, Mushrooms, Gruyere and a Fried Egg – A Winning Recipe!